It’s not too early to Start Gardening Now With These Container Garden Supplies. Grab supplies, an idea of what you want to grow and start preparing for a year of fresh vegetables grown right in your home, back yard or on your front porch. Container gardens are tons of fun to create for your family to enjoy together. From small individual pots, to intricate containers housing multiple plants, you can create just what you need to feed your family a wonderful variety of freshly grown produce right from your own yard or home. Does Gardening Save You Money? Heirloom Organic Vegetable Seeds: This kit contains 50 great varieties of the best organic heirloom vegetable seeds. For less effort, you can pick up just a few of each variety you wish to grow. This kit is a great starter and gives you some wonderful and delicious vegetables that you family will love. Aero Garden: For those who want to grow some fresh herbs or lettuce year round, an Aero Garden is the ideal supply to invest in. Not only will this give you a great container garden anywhere in your home, it will become a favorite thing for your kids to help out with! 4 Tier Mini Greenhouse: To get a jump start on your indoor or outdoor container garden, this mini greenhouse is a great investment. Start growing your seedlings in the safety of a greenhouse right inside your own home. This fits perfectly in small spaces, and is a great way to create healthy plants that will provide your family with the foods they love year round. Stack A Pot: This fun multi pot container garden is perfect for growing multiple varieties in a small space. Great for herbs, lettuce and small vegetables. 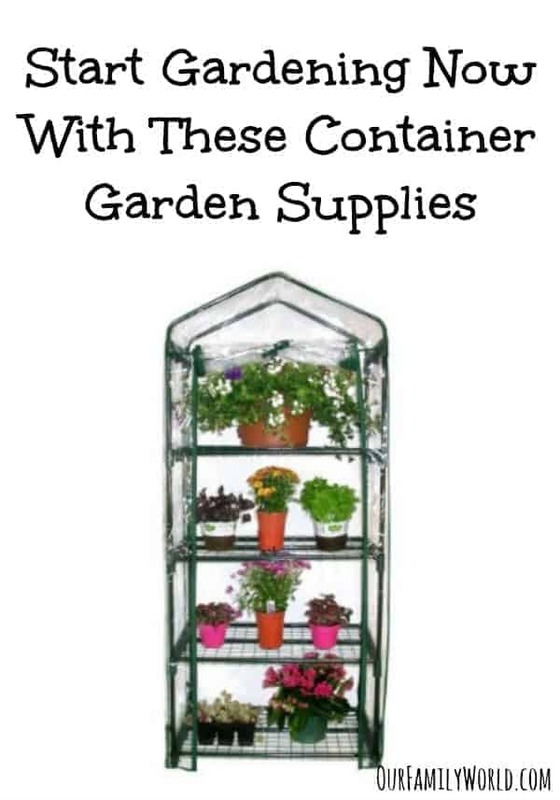 These fit easily on porches, in corners or on balconies to give you an excellent start to a container garden that will provide your family with the fresh foods they love. Feeding your family healthy foods is made easier when you begin with these container garden supplies. Not only will you have great food at hand, but you can grow them yourselves in the comfort of your own home. Don’t get limited by these supplies. Look around your home and online for other simple and easy container garden ideas that will fit perfectly into your home and limited spaces. Work year round to create fun container gardens that provide your family with food no matter the season. Have you started a garden? What are your favorite container garden supplies to use? Tell us in the comments! Really like the Stack A Pot, going to see if I can find one of those for our deck. I love the mini greenhouse, I had something similar in Europe and by this time of year it would already be set up and running. Here though we still have snow and temps hovering around 0C at the moment. Those are some great ideas! Now that the weather is starting to warm up a bit and its sunnier longer, I’m anxious to get out there and garden. I will definitely keep your suggestions in mind when I go shopping for my garden supplies! The Stack A Pot containers are one of my favorites. My kids would love to help out in a garden if we were to make one. It would be great to have fresh herbs to use in our cooking. Aero Gardens seem so beatiful and new to me. I love them. I want to have 10 in my house all over. They have a futuristic appearance. I’d love starting simple gardening projects like this. It would be nice to grow the herbs that I use on a regular basis. My sister does a lot of container gardening, and she loves it. I think I might get into it myself. Thanks! This is a great idea. I’d love to do something like this with herbs. Fresh herbs are SO good for cooking. I have an AeroGarden I got second hand and I use it for everything- I don’t start seeds indoors without it. I’ve always wanted to get more into bulbs, but I’m still a novice at container gardening. I hope to start a small garden with my kids this summer! I think it will be a nice activity, responsibility for them and provide us some fresh produce! I can’t wait! Thanks for the tips! Now this is what I need. All my plants are neglected! My husband should be starting his seeds soon this year! I am hoping his garden is just as successful as last year. This is a great list – I think this is an awesome way to get started in gardening.